A combination of urea, battery liquid, caustic soda and sedatives mixed with the alcoholic brew reportedly led to the liquor turning poisonous. New Delhi: Seventy-two people have died in the last 72 hours after consuming illicit liquor in Haridwar, Saharanpur and Kushinagar. 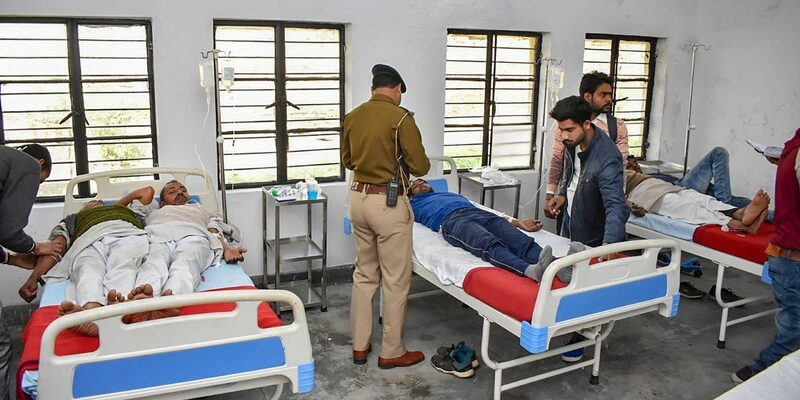 The deaths occurred in two separate incidents in eastern Uttar Pradesh’s Kushinagar and the adjoining districts of Haridwar and Saharanpur in Uttarakhand and western UP respectively. While eight died in Kushinagar, 64 have died due to the consumption of the spurious liquor in Haridwar and Saharanpur. Several more are battling for their lives. A combination of urea, battery liquid, caustic soda and sedatives mixed with the alcoholic brew led to the liquor turning poisonous, the Times of India reported. “FIRs have been registered at three police stations. A crackdown was done by a joint team last night. At least 30 people were arrested, 25 FIRs registered. More than 400 litres illicit liquor was seized. The crackdown will continue until this is completely finished,” Dinesh Kumar, Saharanpur senior superintendent of police, told ANI. Thirty-nine people have been arrested while more than 30 administration and police officials have been suspended in Saharanpur and Haridwar. The police also raided several locations where spurious liquor is known to be brewed and seized the liquor. The police have announced that the National Security Act will be applied against the main accused. “We will catch everyone involved, either this side of the border or that side. This will be an ongoing operation. We cannot deny the deaths but we will clamp down, we have been applying pressure on the border areas and we don’t know the manufacture of spurious liquor in our areas,” said Dinesh Kumar. While announcing compensation of Rs 2 lakh for the families of the deceased and Rs 50,000 for the families of those under treatment, chief minister of UP Yogi Adityanath also pointed fingers at the Samajwadi Party. “These types of incident happened in the past also, where many a times SP workers were involved. Government has announced Rs 2 lakh each to the kin of the deceased and Rs.50,000 each to those who are under treatment as compensation,” he said.